March, as it happens, hasn't turned out quite the way I'd (we'd) expected. Spring is definitely here. I've been doing my best to appreciate it. 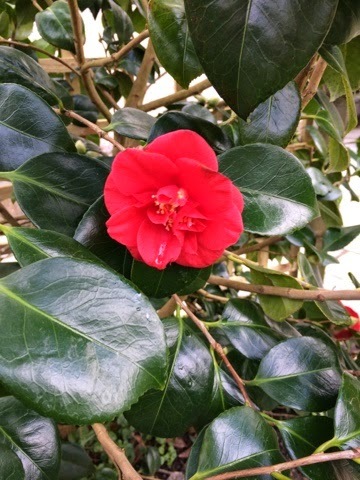 Looking out for new growth in the garden, enjoying sunny days, buying some new garden furniture, seeing my camellia burst into flower, having some work done to make the garden secure, enjoying Mother's day, making pom poms (in blue wool!) to turn into Easter chicks. In amongst all this we have a sick child. Potentially she might be very, very sick. In the last weeks the medication and the surveillance have become second nature. There have been trips back to the hospital, where indecision and caution (and waiting, oh the waiting!) seems to be the name of the game, especially in paediatrics. I understand this being involved in healthcare professional education but it is frustrating. How on earth do you get a 2 year old to take nasty tasting medicines? She's no fool and knows when it's coming! She's not up for bribery either anymore. If anyone says just point it on the inside of her cheek, they're seriously deluded by her capacity to struggle, not to swallow and just spit it out! Shes very determined (but not as determined as me!! Current vehicle of choice Dairy Milk Pots of Joy - the irony!). So I'm a little bit in denial about it all, a little bit let's wait and see what they say this week, a little bit preparing for the difficult discussion. What's surprised me the most is how easy it is to feign normal. And for the most part it is normal - her behaviour is that of a normal, happy 2 year old. To look at her you would never know. So I've been a little bit out of the loop. I've not really commented on anyone's blogs although I've been reading them I've not had the access (what is it with commenting on your phone?) or brain capacity to string together coherent thought.. I'm hoping that April will pick up and normal service will be resumed. Fingers crossed. In the meantime, bear with me. Oh, I really hope everything is OK. Reading this made me feel quite upset for you. I can't imagine how hard things must be at the moment. You do just keep on going, don't you? Because you have to. Don't worry about reading blogs or commenting. We'll all still be here. Just take the time for your family and yourself. I'll be thinking about you and keeping my fingers crossed. I haven't commented before but was sorry to hear this. Sick children are so stressful for mum and dad. I'm sorry to hear this news. I will hope for the best. I understand the fear and worry, as my older child lives with a chronic medical condition. When he was younger, and medicines were hard to get into him, we used to use a syringe and sort of shoot it toward the back of his mouth to help him swallow it. Sometimes we mixed it into other foods or drinks. Do pharmacies there let you add a flavoring to medicines? We can do that here and it can help. Take care and know I'm thinking of you.